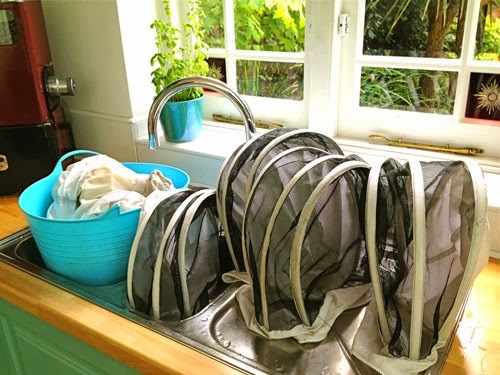 The Beehive is obviously the main item that gets all the cleaning but I have noticed over the years two important items that get very overlooked. So its time to highlight these and in doing so I hope it will make your bees and beekeeping a more happy event. This is one of your most personal items, used every time you open a beehive. Whatever fuel you use to make your smoke, be it, bits of leafs, wood, cardboard, hessian sacking, all of those fuels will produce a build up of tar in the smoker chamber, lid and base. Over time this makes opening and closing the lid difficult and can lead to the seam of the lid splitting under force. The tar build up also creates a smelly harsh smoke that your bees will not like and as the tar build up comes under heat will drip out of the funnel end of the smokers onto your bees and frames. I notice these dark brown patches all over the equipment of others and this is very easy to avoid. Don’t bother trying to scrap the hard tar from the inside and out of your smoker- it will take you days to clean. Just fill a large bucket with cold water and a teaspoon of soda crystals. Then place your smoker spout first into the bucket. Take care that the water level is not so high that it touches your bellow. If the bellow gets wet the wood could swell and split. Let this soak for 24 hours then using a soft washing up brush you will be able to remove most of the tar with ease. Any thick layers may need a bit of gentle scraping. Take care never to apply to much force to your smoker. Most smokers are made using a pressure pinch seam and not welded, so with force can come apart. We clean our smokers in this way once a week. We have useable smokers over 30 years old. I visit apiaries around the country and find a common occurrence- bees following the beekeeper once they step outside their house. They tell me that their bees come up to them straight away and bother them before they have even stepped near the hives. I ask ‘When did you last wash your bee suit’? They reply, ‘Well I don’t do a lot of beekeeping, its been a while’. The problem they are creating is that any bee venom on the suit is a natural ‘Bee Alarm’, the bees natural defense signal to rally the troops. So after a session of beekeeping no matter how careful you believe you have been, there will be bee venom on your suit and that will stay there until you wash it. Days later when you put it on again and step outside your door your bees will be alerted to you and of course come flying in to investigate. Also studies show that once the venom has dried on the material it turns to powder and is lifted into the air. You will breath in this airborne venom and have unnecessary expose to bee venom even though you have not been stung or secondary exposure to those around you. It has been known that beekeepers over time build up a toxicity level to bee venom, thought to be caused by too many bee stings, but taking in the fact of exhaled bee venom this increases the risk of over exposure even if the beekeepers is careful to avoid direct bee stings. One of the main reasons beekeepers are reluctant to wash their suits is the fear of contaminating there washing machine with beeswax and most importantly PROPOLIS! I have so many article of clothing with permanent brown stains due to the fact that a tiny bit of propolis residue was on the side of the washing machine drum and spread onto all my other cloths when I did a new load. So always hand wash your bee suit in a designated big bucket that will only ever be used to wash a bee suit. I use a 20 liter plastic builder bucket. This eliminates the cross contamination of wax and propolis within your clean washing machine drum. You can use any detergent, just don’t over do it. About one egg cup is enough to remove bee venom, dirt and sweat. There is a myth that bees will sting you if you use deodorant, perfume or washing powder. I have found that I aways use deodorant and it has never caused any problem with our bees over the past 90 years of beekeeping. Perfume I believe is not a must and could be applied after beekeeping to limit any possible problem. Washing powder I have always found the bees teat me with very little interest when my suit is freshly washed so I can recommend this highly. Again do not use your lovely clean home dryer for this. If you do propolis will contaminate your dryer drum and ruin many future load of your cloths. What I do is put the bee suit in a large old pillow case and seal the end. Then I put this in my washing machine and put it on the spin cycle only. This removes 80% of the water and I can then leave it to air dry in the room. Veils should only ever be hand washed in cold water and air dried due to the fragile nature of the mesh.